You always know that you are going to get some great original music from this lineup and so it is with this album that blends country with soul and in many ways, because of their approach, can be slotted into a tiny but genuine category of ‘country soul,’ such is the quality and balance Danny and his band are able to summon. Whilst they have always been known predominately as an ‘alt. country’ band a genre that their songs are rooted in, there is also an incredibly strong soulful element on this album, more so than on any other of their recordings (that I’ve heard), a genre to which Danny’s vocals do perfectly lend themselves. The lineup is Danny George Wilson on lead vocals and acoustic guitar, Chris Clark, bass and vocals, Steve Brookes on Drums and vocals, Paul Lush on guitar and vocals and Geoff Widdowson on saxophone, organ and vocals, as well as various former ‘Champs’ members and even the tremendous Foghorn Leghorn. They are often described as ‘rustic Americana,’ a title that is perhaps less accurate with the additional strong dose of soulfulness inherent on this current recording, although it does sum up much of their output, quite a compliment for a British based band. Danny’s vocals have always had a strong soulfulness but have perhaps been disguised by the powerful country instrumentation, although now it’s as if they have realized their talent is such that they are able to open up and go in a direction that is totally natural and unique to them. And make no mistake, this is a band that contains vocal and instrumental skills far above most of their peers, enabling them to go in any musical direction they wish. (Never stop building) That Old Space Rocket sets the scene with chiming twangy guitars, steel guitar and Danny’s evocative vocal on an excellent album opener that is full of melodicism and feeling on a strong tale that promotes the philosophy of always following your dreams and forging ahead. It is followed by Cold Cold World with more lovely steel guitar and a hefty drum beat on a song that is part country, part soul but all musical quality. 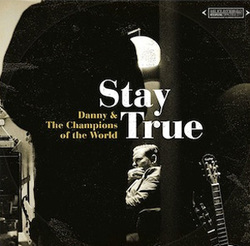 It is a tremendous love ballad, with excellent harmonies and Danny’s vocal being a little reminiscent (for me at least) of 1960s ‘soul.’ Some brass instrumentation is worked into the mix and works brilliantly alongside the steel guitar, adding to the always strong presence of soul meeting country and feeling incredibly comfortable together. Other Days, with it’s soulful horns and vocal is a terrific song that also includes steel guitar on a tale that despite the steel, falls more into the soul category but as with everything else on this exercise in musical excellence the blend is perfect and really propels them into an almost unique genre. Next is Breaking Out, a song that contains some lovely banjo as well as intermittent dobro and mandolin giving a change of direction into a strong country mode although Danny never loses the powerful soulfulness from his voice. Despite that change the song never sits outside of the albums overall feel, all being tied together by those distinctive vocals, the instrumentation and extraordinary musical skills of all concerned. Finally, Let’s Grab This With Both hands delves back into soul territory on a very good song that blends horns with a little twang and steel and more of those tremendously soulful lead and harmony vocals. Overall this tremendous album has a lovely ebb and flow with it’s perfect blend of what can really be termed ‘classic country’ and ‘classic soul,’ both being equally used in the foundations of this possibly career defining album! Their next recording will be well worth watching out for. On the strength of this I’m sure all roots music fans wait with bated breath!